I have bad feet, and when you spend as much time wading as I do, good wading boots are worth their weight in gold. I’ve just spent the past season wearing Simms G3 wading boots, and I’m going to keep my statement about them pretty simple - their comfort and performance is far above any other boot I’ve ever worn. I also added some Simms Hardbite Studs, and Simms Alumibite Star Cleats, and grip whilst wading is amazing. I just picked up a pair of the new Simms G-3 guide boots from Darren at Untamed Flies and Tackle and fished in them for three consecutive days in difficult rocky conditions. To say I’m impressed would be an understatement. There are not many wading boots I haven’t tried and I’ve found it impossible to get any boot over the past 20 years to allow me fish in comfort. These new boots from Simms are a game changer. Super comfortable, they feel light and agile. The eyes for the laces seem to extend closer to the toe allowing for a tighter fit and it also seems that there is a little more space in the toe box of the shoe. 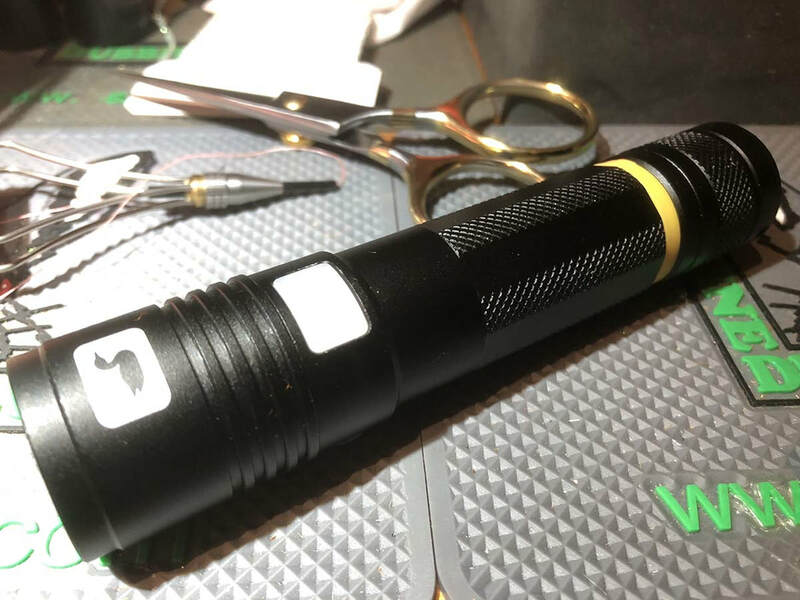 The grip is exceptional as always and the build looks solid and capable of many years fishing. 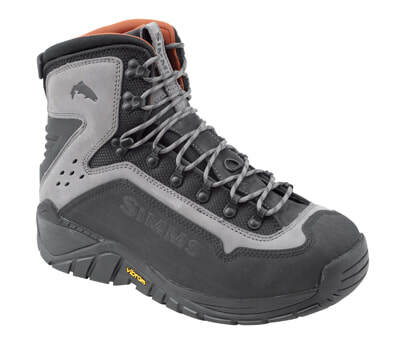 If you are looking for a new pair of boots it will be very hard to beat the new Simms G-3 Guide boots. Last thing I will mention is that the boots are definitely dual purpose, as they excel at both wading and hiking. This = comfort. 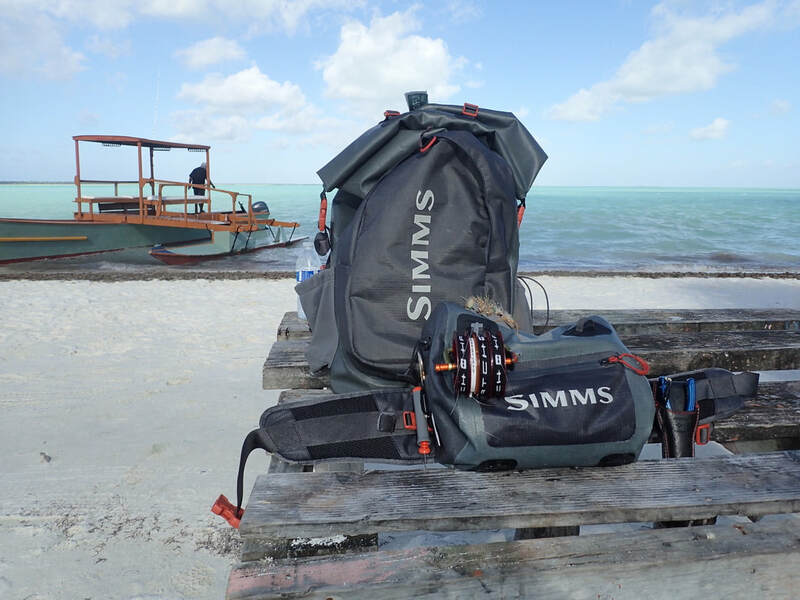 I've just returned from another successful trip to Christmas Island, and I thought I'd quickly share my experiences with some outstanding Simms gear, in particular, the Simms Dry Creek Backpack. I've been looking for the perfect multi use back pack for quite some time now. Unfortunately, every pack I've tried so far has fallen short of ticking all the boxes required. 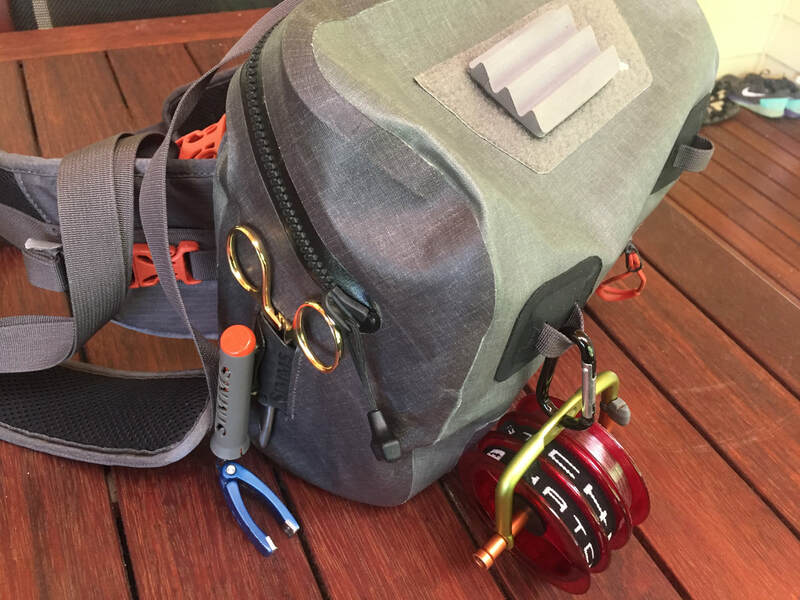 I was very excited when the backpack arrived in a delivery from Manic Tackle Project, as I could tell straight away that the bag and I were going to get along brilliantly. Fits within maximum size for air travel carry on luggage for most airlines. 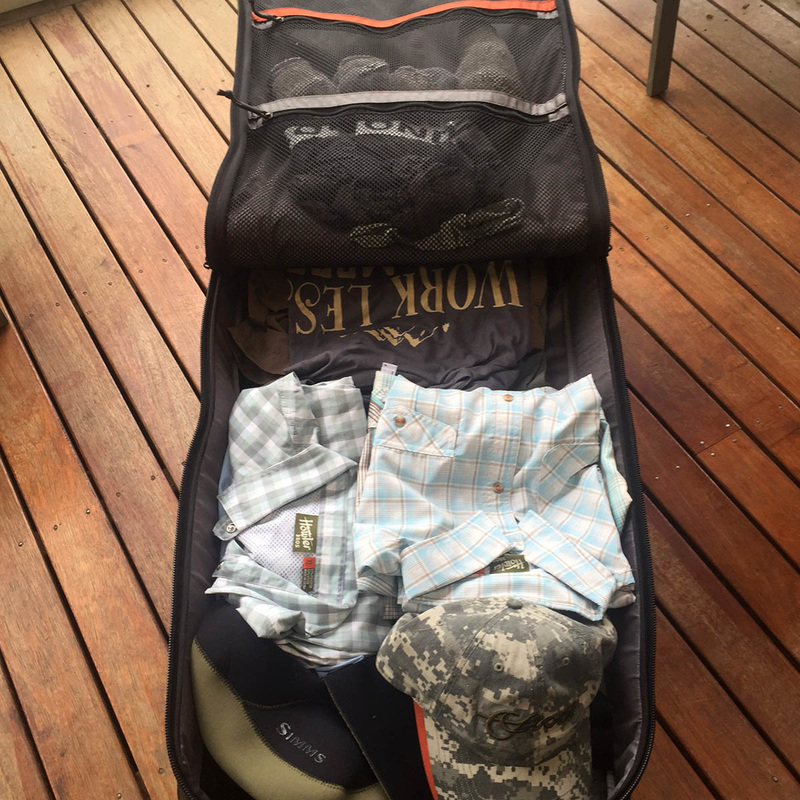 Fits large flats boots, one set of fishing clothes and essential carry on gear for air travel, weighing in under the 7kg max total. Expands large enough as a 45lt backpack to accommodate an overnight camping trip. Exterior u-shaped zippered pockets with interior stretch mesh. These are not waterproof, but handy for storing quick access items such as tippet, leaders, snacks, waterproof fly boxes etc when on the water, or for quick access items when travelling. Ergonomically-shaped shoulder harness with sternum strap and waist belt. ​So how did the bag actually perform on the trip? 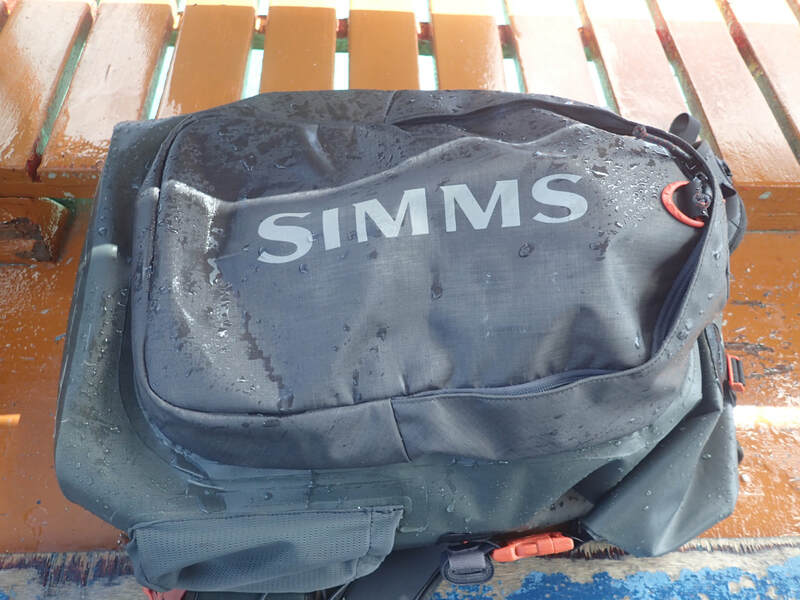 The Simms Dry Creek Backpack doing it tough as a boat bag. For travel through the airports, the exterior pockets were perfect for quick access to my MacBook Air, iPad, travel documents, passport etc, which made navigating customs very easy. 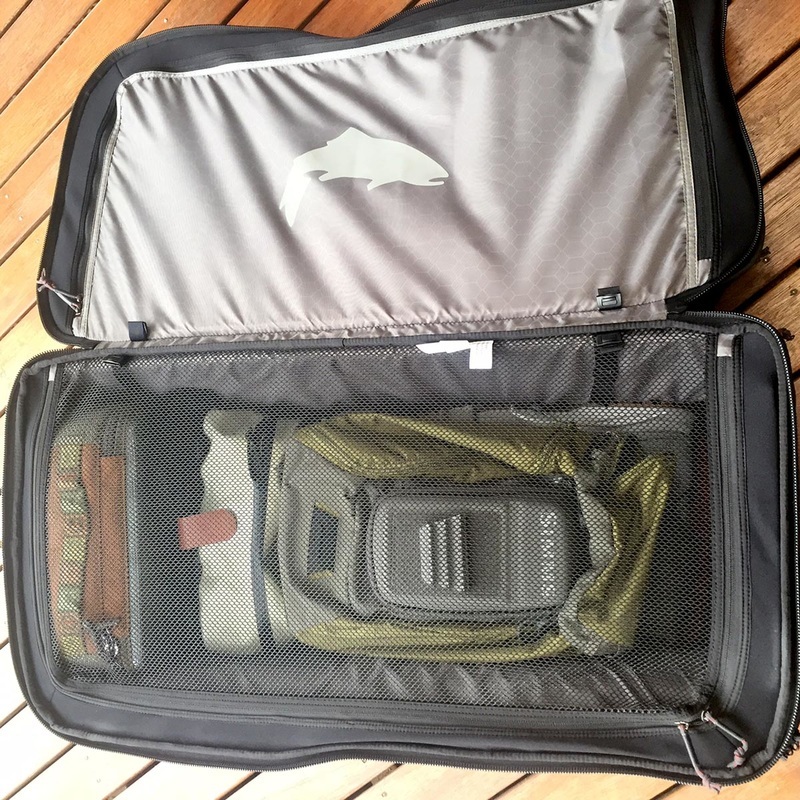 There was no need to even open the main compartment, and it all fitted into Fiji Airways carry on requirements perfectly. 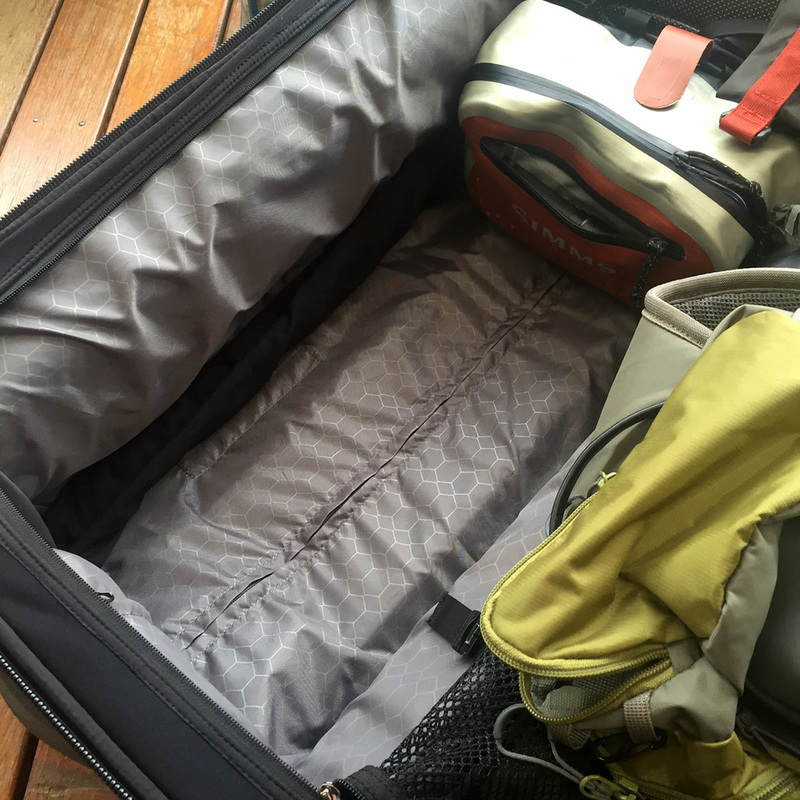 The bag also accommodated my #13 flats boots, a full set of fishing clothes, and all the other essentials you should take as carry on with you. Win! 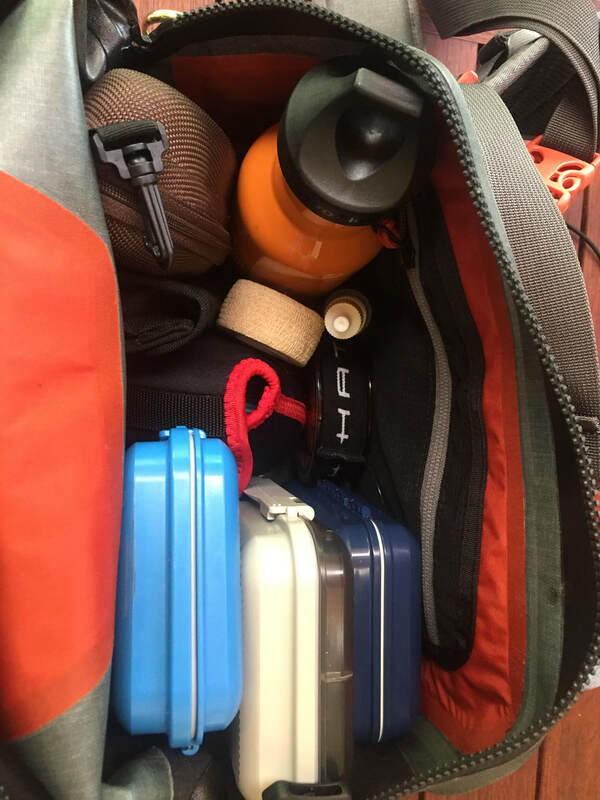 Once on the island, I emptied the bag of my travel bits and pieces, and loaded up the main waterproof compartment with my full remote area first aid kit (which proved handy a couple of times), spare reels, jacket and snacks. The bag then took up duty as my waterproof boat bag. ​It proved to be robust, waterproof, and effortless to transport to the boat an back each day. The rod tube sleeve also gave me somewhere safe to store a broken rod on one occasion. Win, again. The Simms Dry Creek roll top Backpack, alongside the yet to be released Dry Creek Z Hip Pack. Given I also tested the Simms Dry Creek Z hip pack on this trip, there was no need to use the Backpack as a day pack. I normally spend several days each week wearing a day pack whilst guiding during the trout season, so by lugging 7kg in the bag throughout airports and different islands, I know this thing is going to excel as a waterproof day/2 day pack. It is comfortable, has an exceptionally well thought out design, and will keep your gear dry if it rains, or if you go arse up in the water. 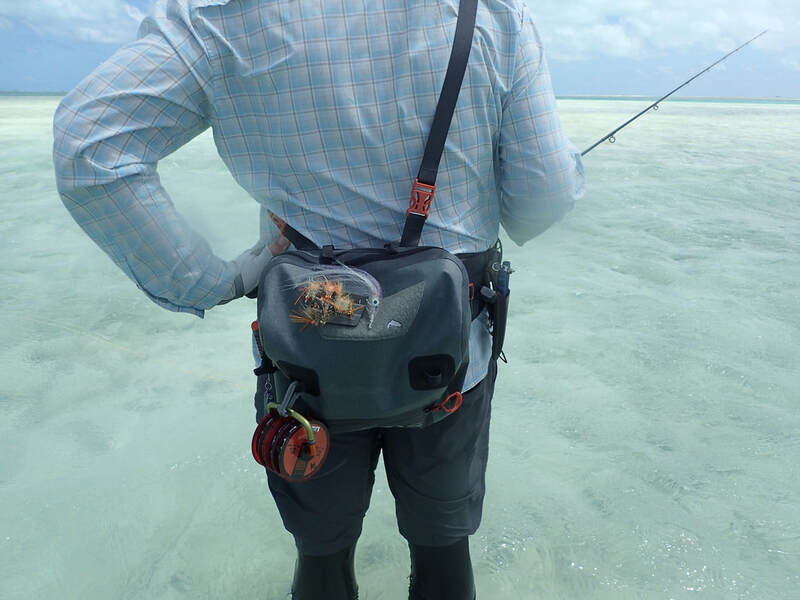 The Catch & Release system compatibility with Waypoints® Convertible Chest Pack adds so much functionality to this bag, and I can't wait to give it a run when trout fishing. The exterior pockets are a massive win, even if they are not waterproof. This is a feature that has been sorely lacking in waterproof packs up until now, as they have really just been glorified, upmarket dry bags. 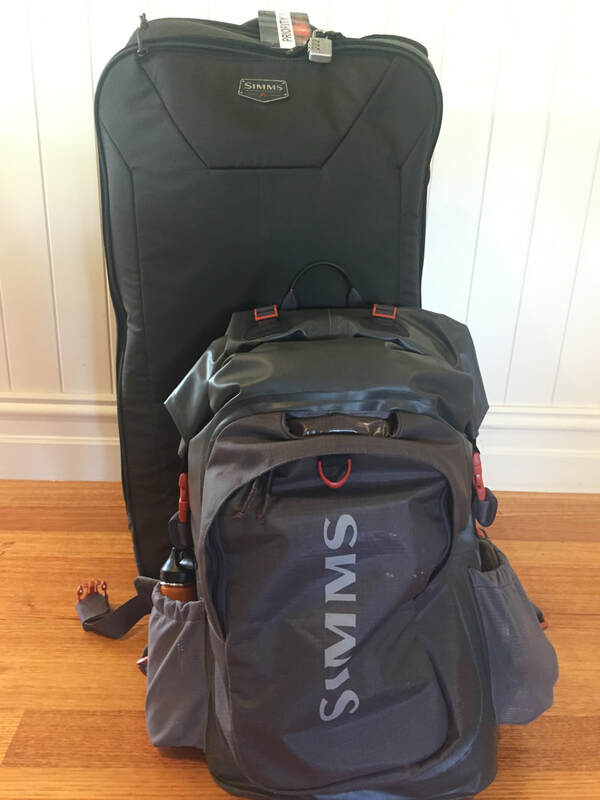 ​In a nutshell, the Simms Dry Creek Backpack receives a MASSIVE 2 thumbs up from me, and I'm pleased to say at the my search for the perfect multi use bag is now over! If you'd like a Simms Dry Creek Backpack of your own, they are available now, and there is more information HERE. I tie over 5000 bonefish flies a year, and spending this amount of time at the vise, you become rather intimate with the tools you use. One tool I am very passionate about is my tying thread bobbin. I have a desk full of different bobbins that I’ve tried over the years, most are ordinary and have failed for some reason or other, and I’ve relegated these to dispensing ribbing wire. Most importantly, I also have a great selection of standouts, and its no coincidence that these standouts are all made by Tiemco. There is one feature that I believe is essential to a good bobbin – a ceramic tube. Why? Simple - your thread breaks less. You can also put more pressure on your thread than you can with a non ceramic bobbin. Tiemco pioneered the use of ceramic tubes for protecting threads during the tying process, and remain the only company to utilise high-quality Japanese ceramics in their bobbins. This is the best value, high performance bobbin available on the market. Like all Tiemco bobbins, it is made in Japan with quality materials. Every fly tier needs at least one of these on their bench. This is the same design as the standard model, but built with a heavy-duty ceramic tube for use with thicker threads. The HD model ideal for saltwater and bass patterns, as well as large streamers. Like all TMC ceramic bobbins, the ultra-smooth ceramic tube will not damage or cut threads. The TMC Adjustable Double-Arm Bobbin is an innovative bobbin which holds the thread spool with four stainless wires. 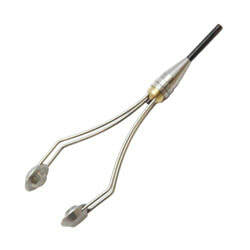 The ceramic tube can be also adjusted vertically to any position. This bobbin also has a substantial knurled finger grip to hold on to, which gives the user firm control, and provides far less fatigue when tying for long sessions. This is by far my favourite bobbin, and I always ensure that it has the thread colour I use the most on it. The TMC Adjustable Magnetic Bobbin is an innovative bobbin holder which controls thread tension with magnetic force. If you are a bit of a gadget person who likes hi-tec and extremely well designed things, you will love this bobbin. I’m a bit more of a pick it up and use it type of guy, so I needed to follow the instructions pretty carefully to make the most of this bobbin. Additional features include; vertically adjustable ceramic tube, thread keeper, and self-standing design. It works really well when you take the time to dial it in correctly. So my advise is to do your tying a favour and invest in a decent bobbin or two, you won't look back! I'm off to CXI in July, and have been researching travel bags pretty heavily during the last 12 months or so. I'm taking lots of gear with me, so I need the best bag I can find to accommodate it all. The final choice in the end was quite easy, as there was only one bag that satisfied all my requirements - the Simms Bounty Hunter 100 Roller. The bag is a clamshell design with stretch gussets to maximize packing capacity, zip-away internal dividers, compression straps to condense your stuff, and interior mesh pocket organisation. 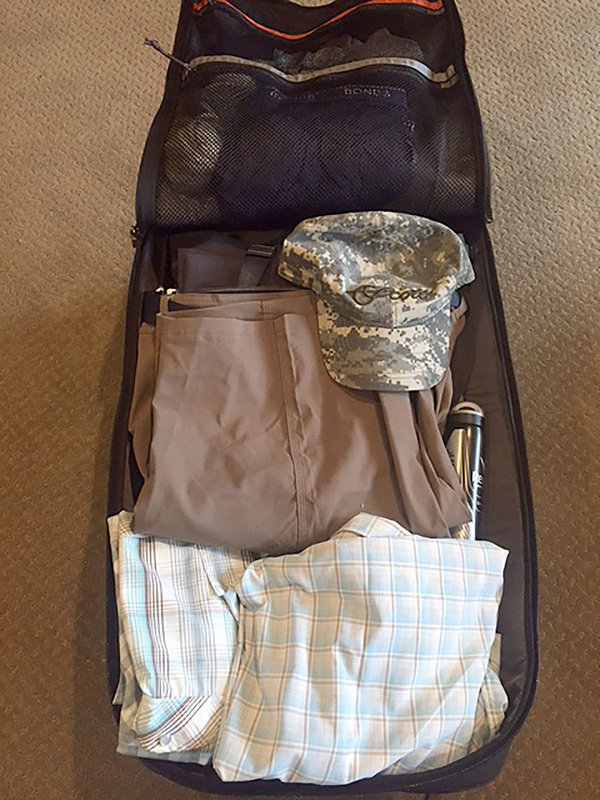 There are lots of options for packing this bag, but I will use the bigger bottom section to store my gear, and the smaller top section for clothing. For scale, the wading boots are size 13 and over 30cm long. 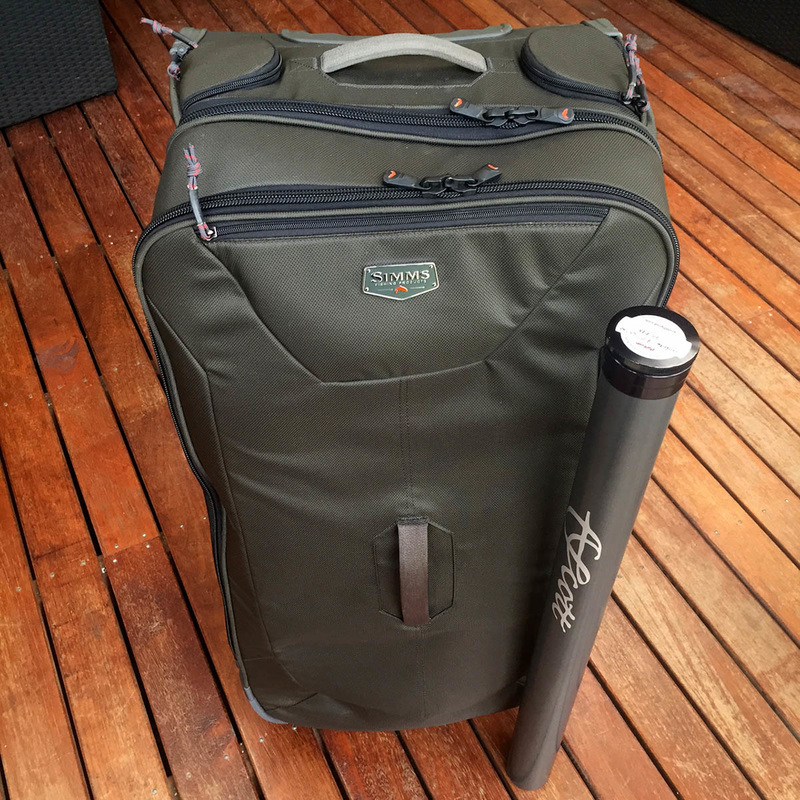 I always travel with lots of gear, and the most important feature I was looking for in a new bag was the ability to pack lots of rods both easily and safely. The Simms Bounty Hunter 100 has 2 exterior rod tube access points that fit 2 rod tubes each, so that takes care of 4 rods in their tubes. These access points are lockable, and the tubes are housed inside internal storage sleeves within the walls of the bag. With 2 rod tubes in the top walls of the main compartment of each side of the bag, the really cool thing is the rest of my rods will fit safely without tubes by sitting under where the hidden tubes extend into the main bag (pictured below). This means I can save weight by leaving my other rod tubes at home. 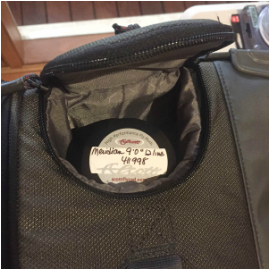 If you are not comfortable with this approach, the bag will accommodate the usual 100mm PVC pipe with caps that most traveling anglers use in their bags for protection. I really like the interior mesh pocket organisation in the top section - no more trying to find socks or jocks hidden somewhere in the bottom of my bag! So what fits in the bag? 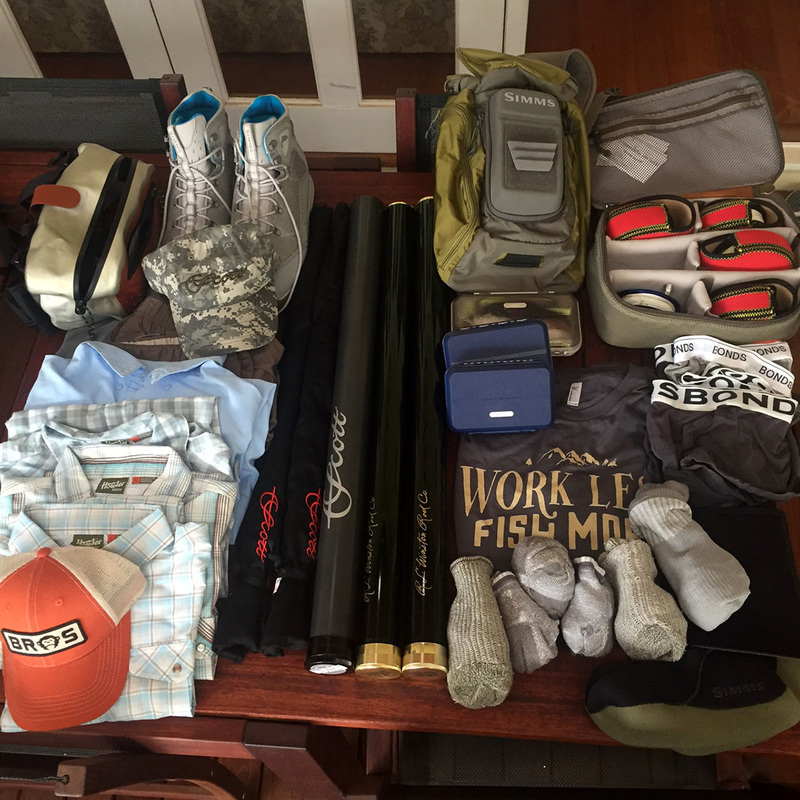 I've performed one quick test pack with the bag, and all the gear pictured below (there are 5 rods and reels) came in at 16kg packed in the bag. 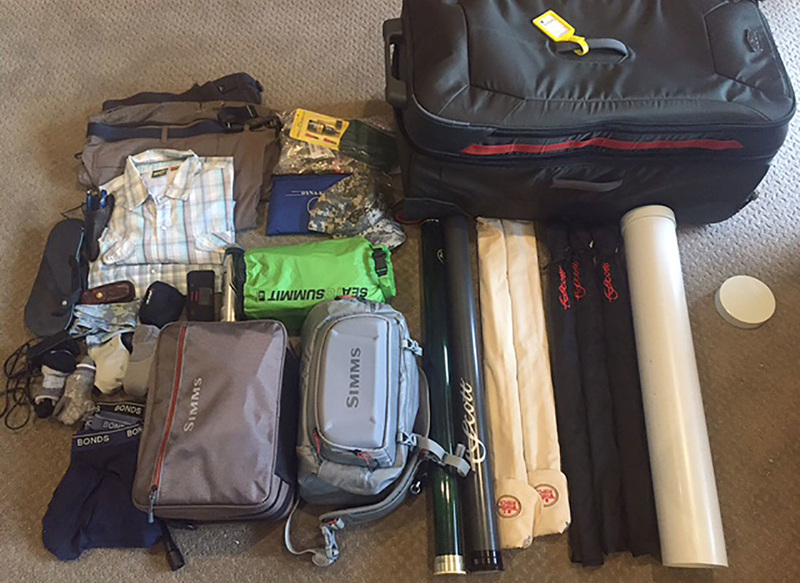 I'll be adding another couple of rods and reels, a first aid kit, towel, and some tying gear, but will make my 23kg limit easily, particularly given I normally take my boots as part of my carry on luggage. The zip-away divider does a great job. 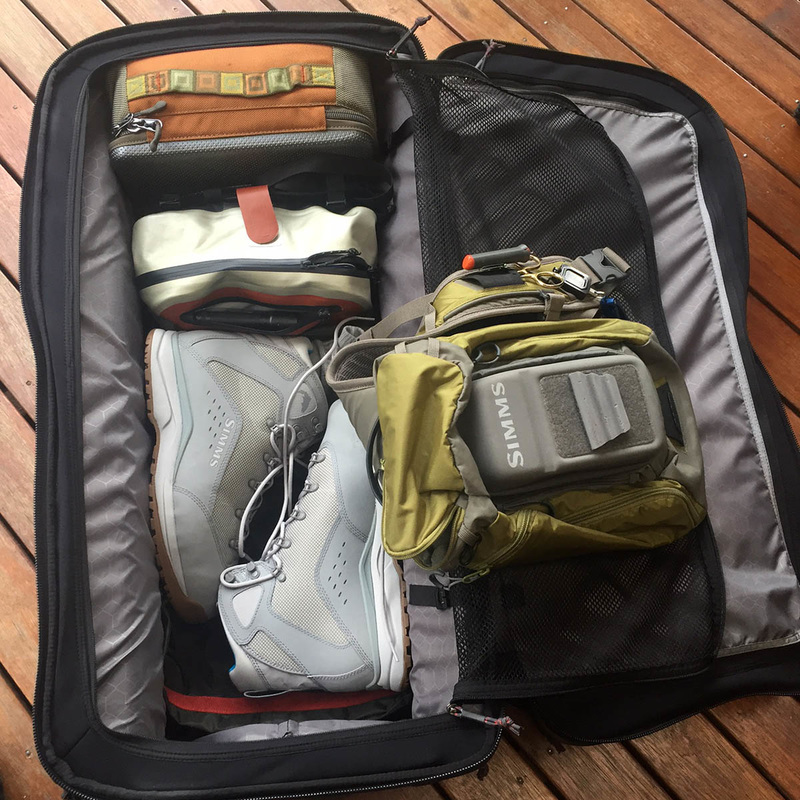 I made a list of the gear I'll be taking to the Island with me, and given the total value of the gear, it seemed pretty stupid to compromise on my travel bag. Simms make outstanding products, and the Bounty Hunter 100 is no exception. 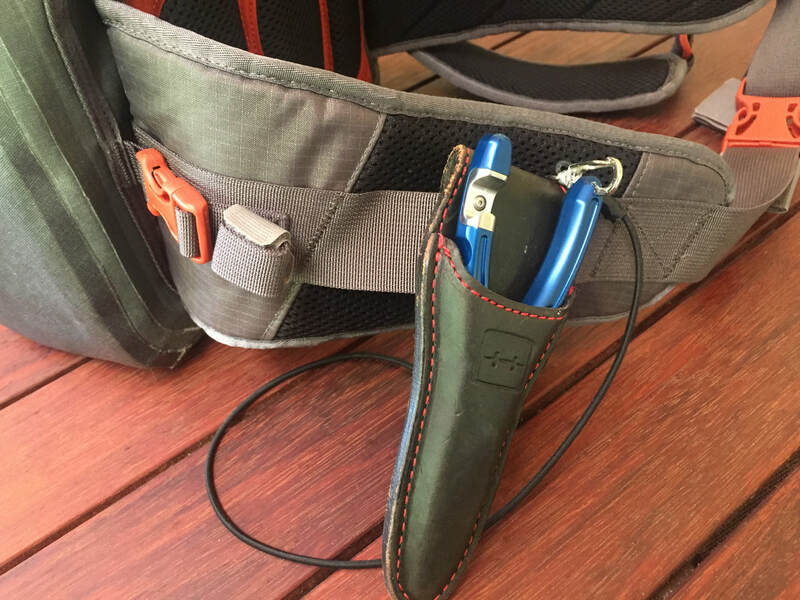 It has been specifically designed for fly fishermen, is high tec, rugged, has lots of substantial grab handles, and even comes with a seam-taped waterproof roll-top bag to store wet gear for the trip home! 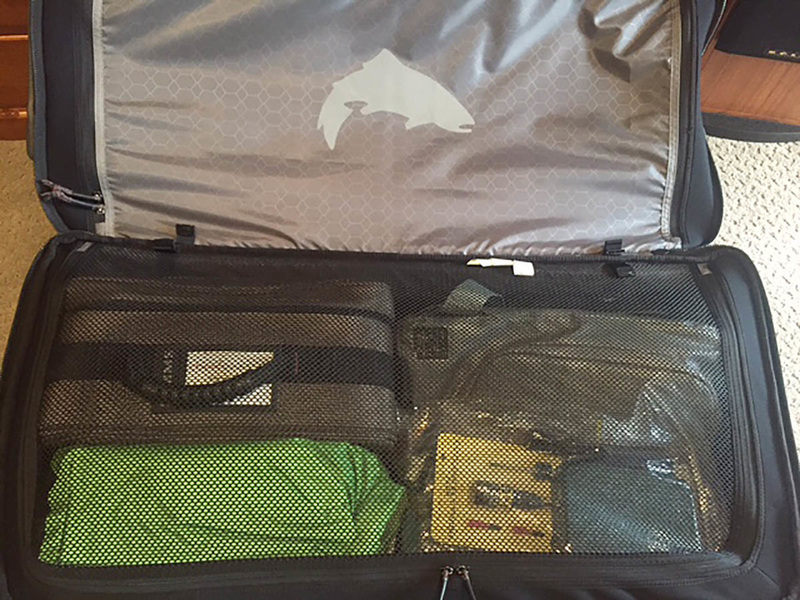 ​If you want the best fly fishing travel bag for International travel - this is it. To say I’ve just been blown away by my new Simms G4 pro jacket would be an understatement. It was comfortable from the first second I put it on, and it kept me dry during a really crappy week of late season fishing in New Zealand. · One MASSIVE back compartment, big enough for a jumper, lunch and more. On the inside of the chest pockets are two built in retractors for nippers etc. These are REALLY handy, as I could tie on new flies or adjust my leader without needing to dig out my nippers in the rain. I thought that the armpit zippers were going to be a waste of time, but I was amazed by how effective they were when I was hiking out. The breathability of this jacket must also be brilliant, as I did not get clammy at any point. There is little worse than it raining outside, and you being drenched with sweat inside. The stormhood and collar setup is outstanding. The micro fleece lining is extremely comfortable, even when the neck zip is done right up. Hood adjustability is great, and you can turn your head without having your cap twisted off your head (something that had previously bugged me in other jackets). The dry cuff system is fantastic. I managed to submerge my arms unintentionally when releasing a fish and still came out with dry sleeves. You also don’t get water running down your arms when casting in the rain. Dry sleeves make a big difference to your comfort levels when fishing in adverse conditions. This is the first time I have ever remained dry and comfortable when fishing in the rain. Yes it’s big bucks, but this highly technical, high quality jacket allows you go harder and stay out fishing much longer - in comfort! What makes a fly good value? There is no shortage of opinions on what represents good value in a fly. Some believe cheaper is best, whilst others believe that quality is most important factor. I’m firmly seated in the second camp; let me explain why. For me, value is achieved when you purchase a fly that does the job you intend it to, and doesn’t let you down by falling apart or not performing as you expect. 1. It needs to be well designed. If it is, it will perform well. If not, it will frustrate you by sinking when it should float, floating when it should sink, spin when you cast it, not hook up when a fish eats it, or manages to hook up on everything but a fish. 2. It needs to be well tied. If it is not, it will fail by falling apart, or the eyes will move, it will float sideways or sink, it will foul up, spin, and the list goes on…..
3. It needs to be tied with premium materials on quality hooks. Poor materials don’t last or perform, and cheap hooks open up, it’s that simple. If you don’t tie your own flies, it can be a bit of a minefield trying to tick these boxes when looking to purchase flies, but let me tell you, price is usually the best indicator. People in the cheap camp believe they are only going to loose the fly in a tree or a fish, so why pay more? Well the bad news is that the cheap flies are usually tied in poorly run sweatshops in third world countries, so if you are paying $1.50 for a trout fly, the fly will most likely be poorly tied using poor materials on cheap hooks, and will ultimately let you down when it matters. Where is the value there? Lets talk saltwater flies now. There are lots of flies on offer, but unfortunately most of them fit into the sweatshop/poor quality category. 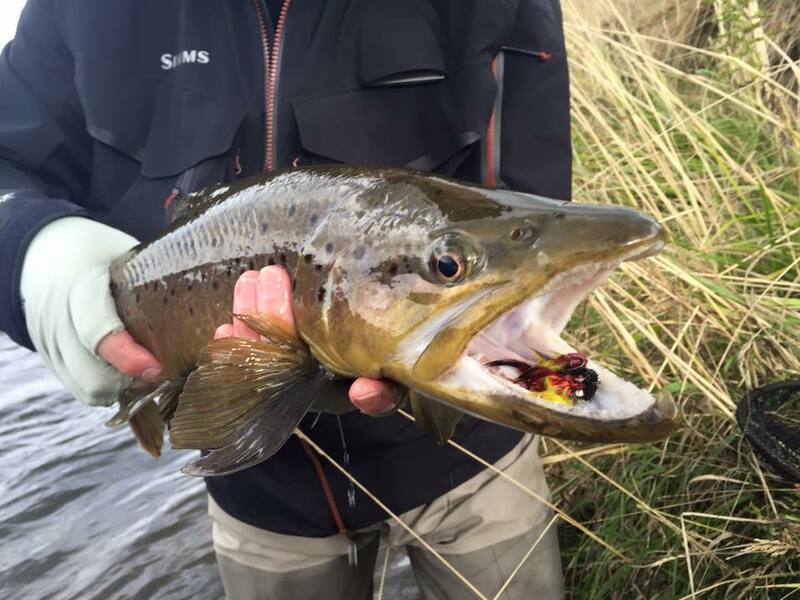 There are a few companies out there producing good flies at a reasonable cost, but if you are spending thousands on travelling to an exotic saltwater fly fishing destination, you should do what the great fly fishermen do and engage a commercial tyer to select and tie an appropriate range of flies for your target species and location. 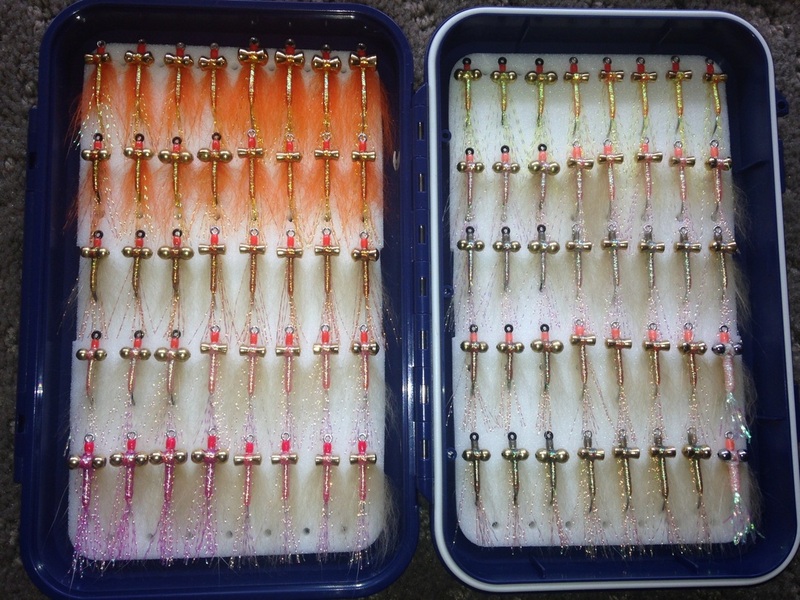 These flies will tick all the boxes above, and is one of the reasons the best fly fishermen catch more fish. I only tie flies for Christmas Island commercially. Why? Well for starters I like tying bonefish flies, and due to demand, they are all I have time to tie. I tie 2 days a week, every week, and tie thousands of bonefish flies each year. I don’t watch the clock when I’m tying, it is all about the quality of the flies. I purchase my bespoke dyed fashion grade Finn Raccoon pelts from Europe, and they are dyed just for me. These pelts are very expensive, but absolutely worth every cent. I could use the cheaper craft fur like most other tyers, but it’s my goal to tie the BEST flies, not the cheapest. I also take the time to coat my bonefish flies with UV resin to increase their durability. It is not uncommon for anglers to catch 20-40 fish on the one fly in the one session. Imagine how many less they would have caught if they needed to change flies every few fish? All flies fall apart at some point, but I like my flies to do an outstanding job before they do. Fortunately, I have a fantastic list of new and repeat customers from all over the globe who see value in my approach, so they are obviously just as obsessed as I am. I am grateful for their support, and will continue to provide them with exceptional flies.